Some meals cry out for hot, buttery bread. I love making fresh bread. And you want to know a secret? It's not so much because I like to eat it. [Well I DO like to eat it], but I LOVE the smell of fresh yeast rising dough! It seems to fill the whole house and screams out fresh home cooking! This time I made yeast rolls, using a basic recipe. And of course there is room from tweaking based on preference. 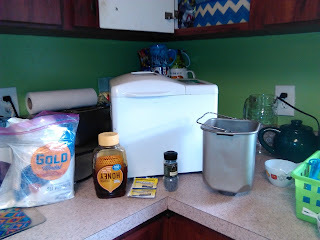 * add one cup warm water, yeast, and 1 teaspoon honey to a bowl. 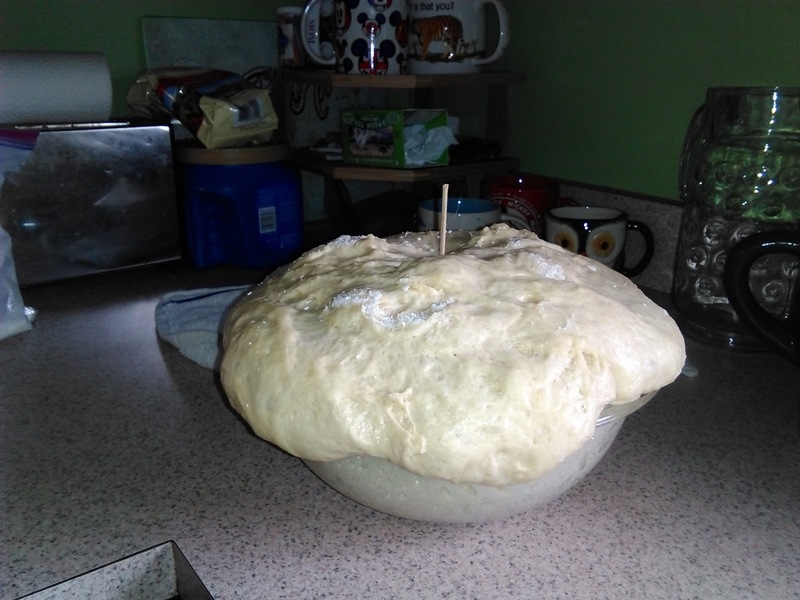 Let sit for 10 minutes until the mixture foams up. * add in eggs, melted butter, and honey to yeast mixture. Mix until blended. * using a mixture with dough hook, by hand, or in a bread machine, add 1 cup of flour at a time. Keep adding flour until dough pulls away from the sides and forms a dough ball. *Mixture will be a bit sticky, if too sticky add more flour. *Generally you will use about 4.5-5.5 cups. *After you have the dough ball, knead a few times, adding flour if needed. *If you using a bread maker use the dough cycle ONLY to mix and form into a dough ball and then transfer to a large bowl and then knead. *Let dough rise at least 2 hours. Use a big bowl as dough will more than double in size. Once dough is risen, punch down in bowl, knead a bit back into a dough ball. add flour if sticky. *pinch off a piece of dough about a little bigger than a golf ball [or any size you wish]. *place in shallow backing dish. *repeat until all do is used and your rolls are all in the baking pan. I topped mine with poppy seeds, but you don't have to top with anything. 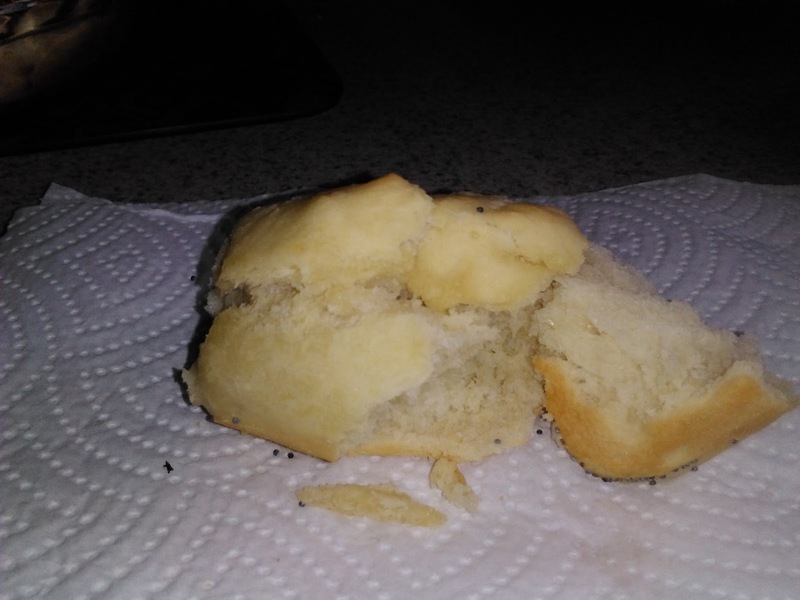 *Bake at 375 degrees for 15-20 minutes [depending on oven/size of rolls]. 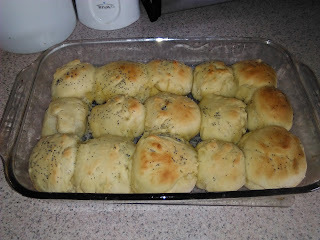 *When rolls are about a minute from being done, pull them out and baste the tops with melted butter. And...there you go. Fresh rolls for dinner! The versatility of these is that you can substitute the honey for a sweetener of choice. If you use regular sugar increase amount to 1/2 cup. You can add cheese into the dough just before making the rolls for a yummy buttery cheddar roll. You can add in rosemary for an herbed roll. Baste the the tops with olive oil and garlic for Italian night! Have fun, play around with it! From our table to yours, enjoy your meal!